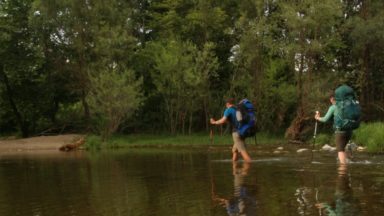 Alex Kendall, creator of the Snowdonia Way, decided to leave Wales and head to Croatia for his most recent adventure. 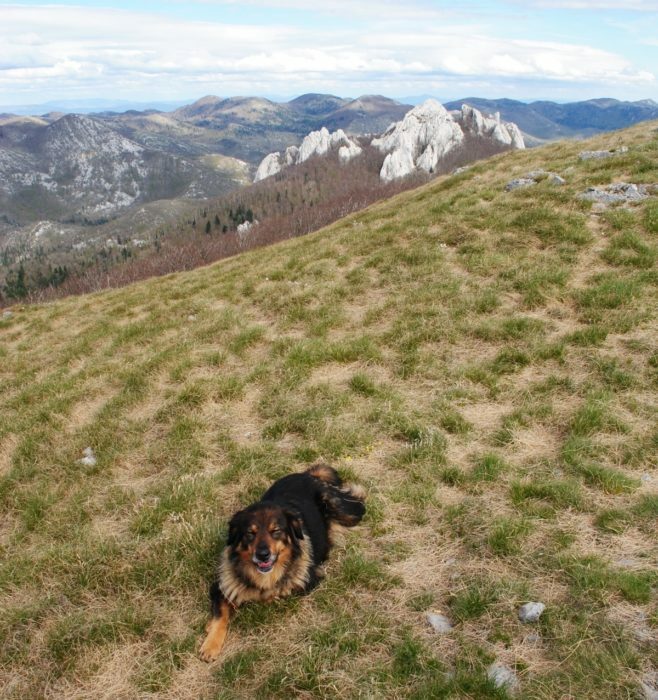 Here, he tells his story of hiking the 100km Velebit Trail where he found amazing mountains, tough walking and had a friendly uninvited dog as his walking companion for several days. 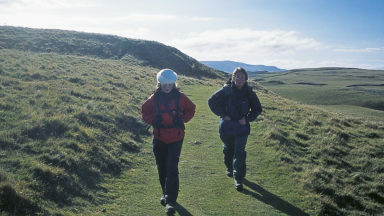 It was spring – not the walking season, but it was warm and sunny, and the mountains jutted up straight from the sea in such an inviting way. 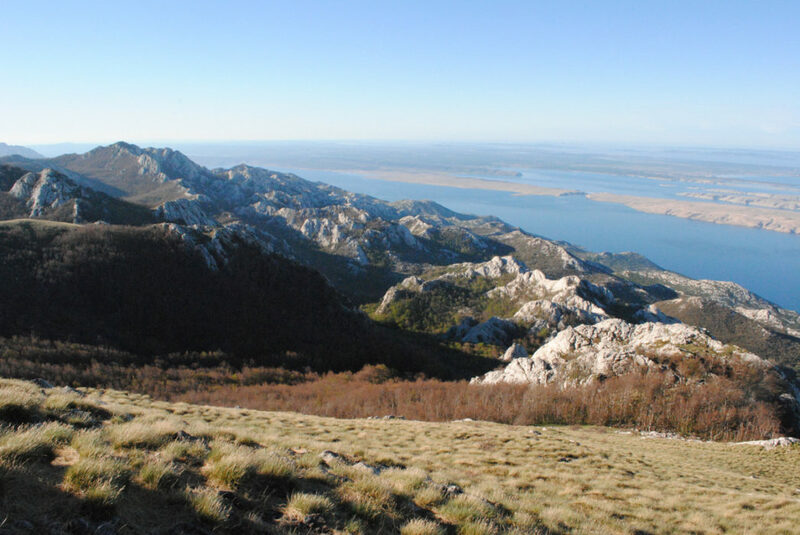 I had come to walk the Velebit Trail, which runs 100km northwest–southeast through the mountains of the Croatian coast. Dropped off alone on the side of the coastal road near the hamlet of Bralici, I began uphill along the marked path towards the first peak of the trip, Gromovaca, at just over 1600m. As in many European countries the paths are marked by paint on rocks and trees, so once I found the start it was easy to follow. There was only one man to be seen, slowly watering crops, and once I plunged uphill into the forest I saw no one for the rest of the day. These mountains are karst limestone, and the forest is broken by open areas of tumbled rock and scree. The sun beat down on me and my bag, stuffed with odds and ends and food for six days. I remember pines and the familiar European mountain smell of vegetation on a warm day. There were purple orchids, pine and oak, and then higher up, bird’s foot trefoil and juniper. 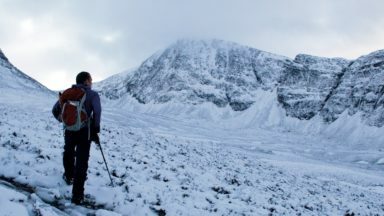 Patches of snow lingered in shaded crevices, and my lack of gaiters meant some of it joined me in my boots for the rest of the climb. From Gromovaca the mountain chain stretched away to the south, with a few peaks to the north, and somewhere in the east blue hills stretched as far as Bosnia. 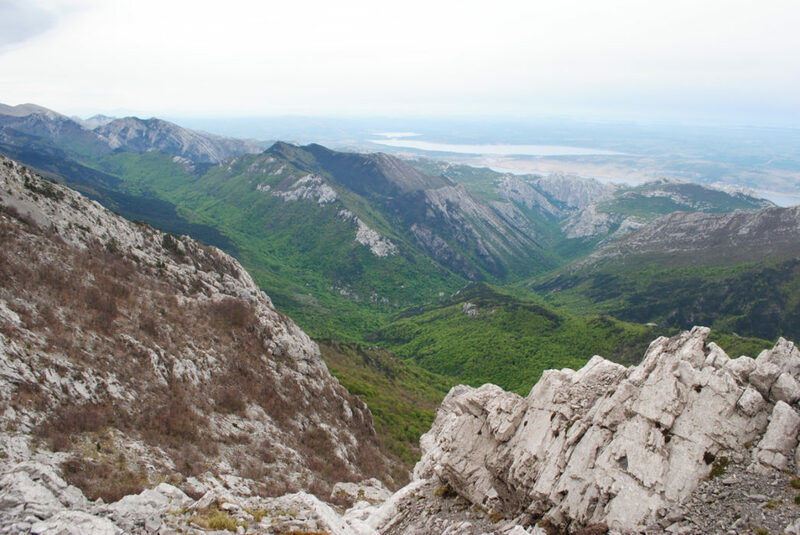 The bizarre mountains of northern Velebit were ahead, domed and cracked Moomin-like peaks. To the west, past the invisible plunge to the sea, islands floated in the haze, some obviously inhabited and some yellow and mounded, like curious anti-clouds, mirroring in rock a cumulus that might hang above them. 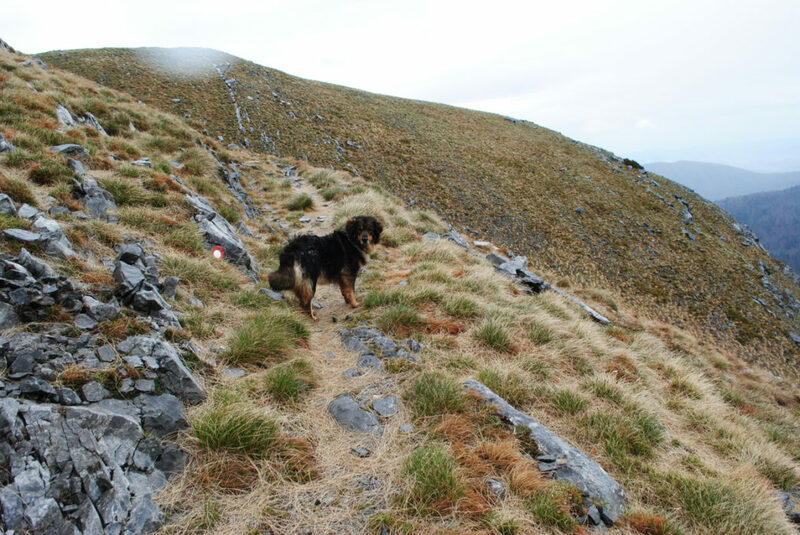 I stopped at a mountain hut to resupply with water, which is fetched by lowering a bucket into an underground cistern. 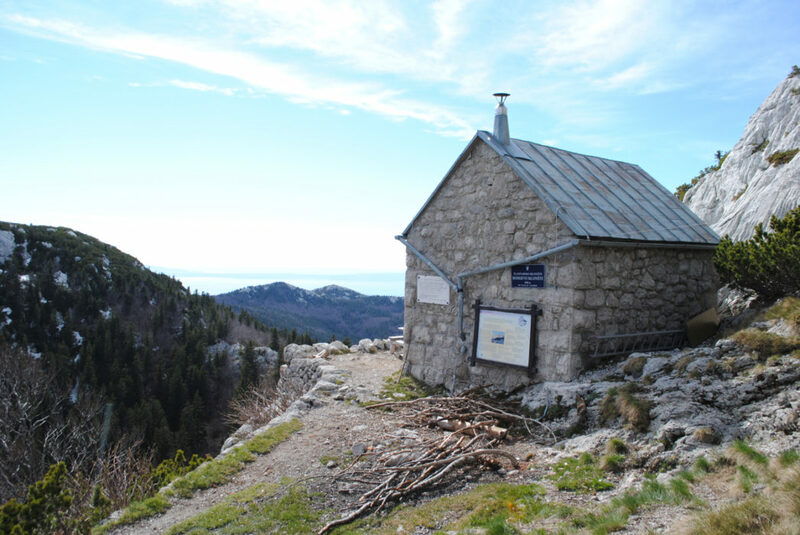 This is fed purely by rainwater falling on the roof of the hut, an ingenious solution to the main problem of walking in limestone terrain: the difficulty in finding something to drink. 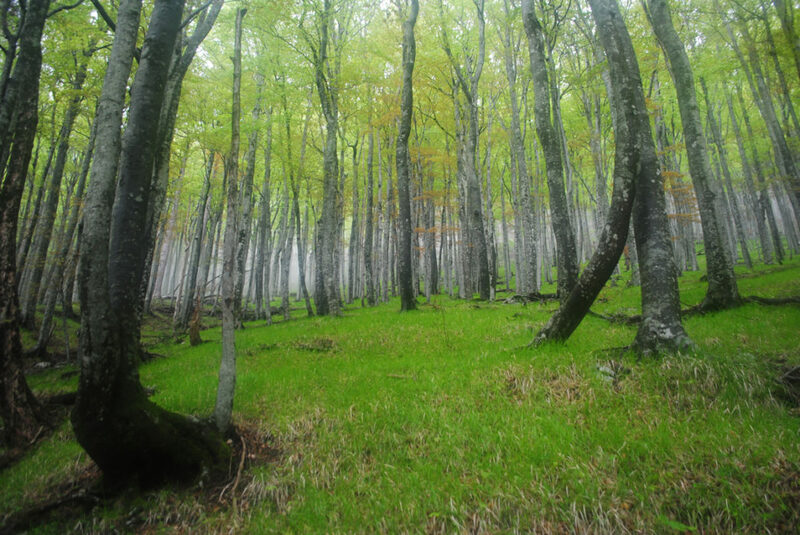 I walked south to the summit of Crikvena, high up in the scrubby forest. The way here is known as Premusik’s Trail, and is incredibly well built – sections of gently ascending rocky path wind through the rough terrain, always finding the most efficient route. Alongside the peaks, the view from this summit showed me the hollows, giant sink-holes that form as water dissolves the rock. A sign later on indicated a famous hole nearby that drops to 500m below the surface. I made a mental note not to fall down a sink-hole. 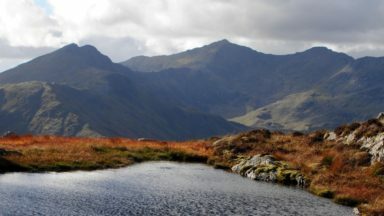 I continued along the flanks of peaks, round the rims of sink-holes and over a grassy meadow flecked with blue flowers. A band of cloud crept in from the north but the sea glowed blue in the afternoon light as I trotted down the path to Alan, a mountain hostel I’d been told would be closed. I hadn’t worried, because the hostels, open during the summer, have ‘winter rooms’ where hikers can sleep for free. I was surprised, then, when I dumped my bag at the entrance, to see the door open, two men pottering about outside, a group of Czech girls and a dog. I asked one of the men if the hut was open. He shrugged and walked off. The girls also had no idea, and as I couldn’t work out where the winter room was, I sat in the warm kitchen and started heating up my dinner on the fire. Little did I know but this was the start of a companionship that was to last for nearly half my trip. 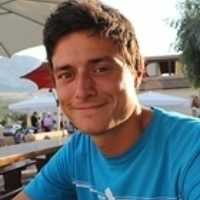 I was talking to the Czech girls, and they revealed that the dog wasn’t theirs: it had been following them for two days. Since I was heading towards Baske Ostarije, where they thought the dog had come from, we hatched a plan for me to try and take it home. It turned out the hostel was indeed open, and the owners soon arrived. They had beer, and the girls had a hip-flask of Slivovica, a spirit of some 50% strength made from plums. I had planned on bothying, but after a long day with a heavy bag, I couldn’t refuse a bed. The second day dawned and off I went, dog in tow, waving goodbye to the hostel owners. The drizzle fell from the high clouds, and the offshore islands floated in a grey plane, bands of rain approaching over the sea. The rain lasted for the morning, stopping as I began my ascent to the peak of Saturina. This grassy mountain stands aside from the main trail, but was a suggested diversion so I felt obliged, despite the grey sky, to sit a while on the top and look out over a dampened Velebit. I caught the dog’s eye. I don’t think it had expected to be climbing mountains and it looked knackered, but when I got up to go there was no hesitation. The weather improved as I followed a lonely forestry track, the trees all conifers, with their dark, brooding, statue-like presence. At one point, hearing first rustling and then crashing in the trees, I glimpsed a whole family of wild boar careering away from me. As I stopped for a rest before the hill of Budakovo Brdo a hare crept out of the trees and stood motionless, watching me. The dog hadn’t seen it. I watched the hare for as long as it allowed, before it disappeared silently into the undergrowth. 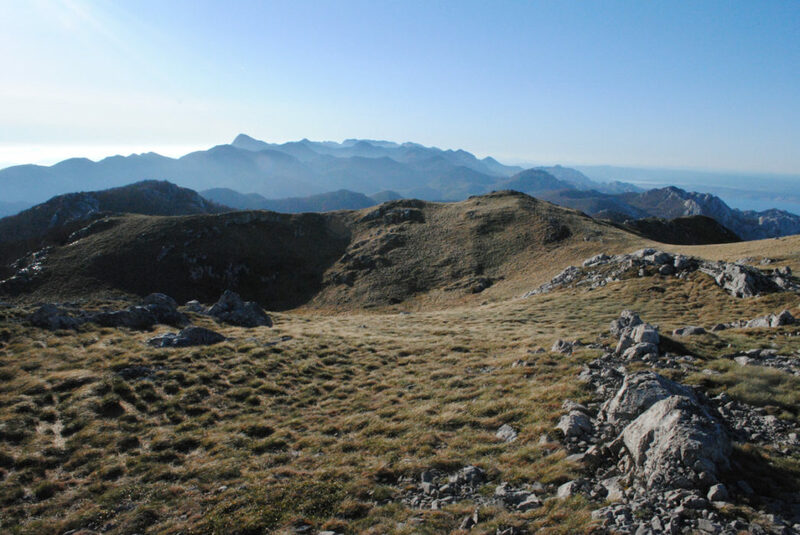 One of the features of this part of Velebit is Bacic Kuk. It is a mass of white turrets, overhangs and shining featureless faces of limestone. Watching it as I walked past in the sunshine it reminded me of Bla Bheinn on the Isle of Skye: an impossible fairy-tale castle, erupting from the trees with new cracks and bulges opening up as the light changed. I was worried about what the dog had to drink, as there wasn’t much water on the trail. On reaching the hut of Ravni Dabar I filled a bowl from the well, but I still had nothing to feed it. The hut was tiny, mostly taken up by a monstrous fireplace, and it stank. Overnight it rained. A lot. The dog barked as the rain crashed onto the hut‘s tin roof. I woke to a misty, saturated day with grey light shining on glistening grey mountains. The wet peaks with their drooping arches and candle-wax turrets looked like they were melting. The rain lasted throughout the morning, and the mist shrouded much of the landscape. Now and then rocky summits would appear as clouds broke, like monsters revealed by the slow parting of a veil. Then they would depart, and only the grey remained. This continued all the way to the village of Baske Ostarije, where I went to the hotel with a wet dog to try and get an early lunch. As I approached a cook leaned out of a window, pointed to the dog, and started smiling, talking loudly with someone else in the room. ‘Is this your dog?’ I asked. ‘Yes! Our dog!’ he replied, with far too much amusement considering it had been gone for three nights. I went into the hotel, had three coffees, and had to resort to choosing at random from the menu, not understanding Croatian and there being no translation. This is a tough game for a vegetarian, so I was resigned to my fate when it turned out I’d ordered the mixed grill. The rain stopped as I began the ascent, out of the village and into woods covered in their summer leaves. Higher up, trees were still bare, and it was a constant source of joy to move continually from summer to winter and back again, sometimes several times a day. The path through the woods was intermittent and the ground soft with water. My clothes were soaked from moving through the undergrowth, and the thick vegetation made waymarkers harder to see. It was after the first hill that I looked back and saw the dog. I had assumed that it realised its mistake after two days of not being fed and had been relieved at being home again. Not so; it looked as jolly as ever. I simply couldn’t allow it to come all the way to the coast with me: it would be marooned far from home with no obvious way back. I became aggressive, shouting and throwing stones at nearby trees, hoping to scare it home. It ran away and I lost sight of it. But for the rest of the day I would always notice it, a few hundred metres behind, stopping when I stopped and now never coming closer. Hours went by in the mist, but towards evening the sky cleared. What greeted me next was less than ideal. Expecting a mountain hut for the night, what I was confronted with was a shipping container, at a jaunty angle, with only two walls. Crates of wreckage were tied together in piles, and bags full of rusty sheeting lay about. The outside toilet was a smashed-up wooden cabin over a filled-in hole. I thought it was workable: there was a wooden board to sleep on, and even some old foam. One of the bags stuffed with sheeting made a reasonable wind-break. I even stumbled across a well a few minutes’ walk away. Only slightly concerned by wolves and bears, I unpacked and dried my kit in the sunshine, hanging things from the jumbled rods and frames like prayer flags to the setting sun. I ate and hoped the wind wouldn’t pick up in the night. I woke to blue sky. This day was the longest of the trip, and I was keen to get going. The dog, who was there in the morning, gave me one last, desperate look, as though wondering how I could sleep in such a place, and wandered off in the opposite direction. I remember that aching day as a series of moments: the clear cool morning air of Veliki Stolac; the sweet smell of vegetation in the sunshine; blinding white limestone; my head calling for rest and shade and water; eerily quiet military instillations; the beauiful hut at Stap with daffodils in a perfect meadow; the mountain wall of Stapina Kuk; and the long crossing of the upland grazing land of Veliko Rujno. Exhausted and with a throbbing head, I sat down by a church before the final climb of the day, 600m onto the high plateau of Paklenica. Around the church cows browsed, a lone paraglider turned on the thermals above, and all was silence. Onwards and upwards as the meadow gave way to the mountain. The high plateau, when I finally crawled up the last stretches of the path, was a strange place. Grassy hollows broken by dwarvish mountain pine woodlands and the odd birch were interrupted by the peaks, rising up another hundred metres or so. With cloud coming in I made for the hut of Struge, tucked away in a sheltering woodland. 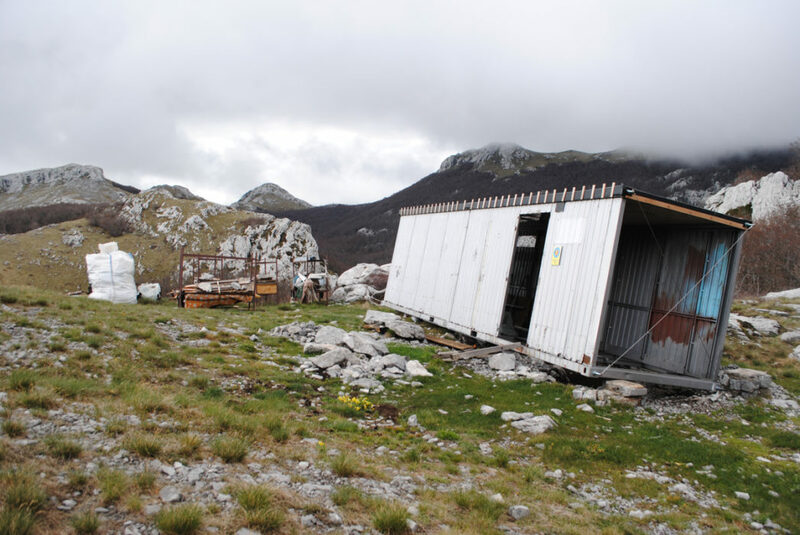 After four days alone it was a surprise to find the hut full of members of the Zagreb youth hillwalking club. Their way of celebrating time in the hills involved making a fire in the rain, drinking, and staying up for most of the night shouting at each other at close range. For me and Edo, a Slovakian who had been wandering the hills for 11 days, this was far from ideal, so at first light I crept out into the misty morning. 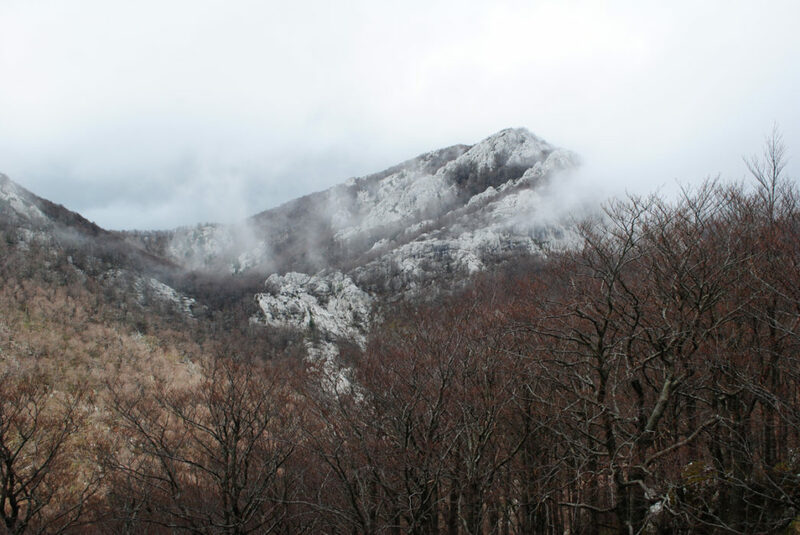 After summiting the highest peak in Velebit, Vaganski Vrh, at just over 1750m, the mist momentarily parted to reveal the eastern plains, clouds strung out above and below, sunshine filtering through, distant hills beginning their rise to other lands. The dark history of the region was evident, with warning signs not to leave the path due to land mines. 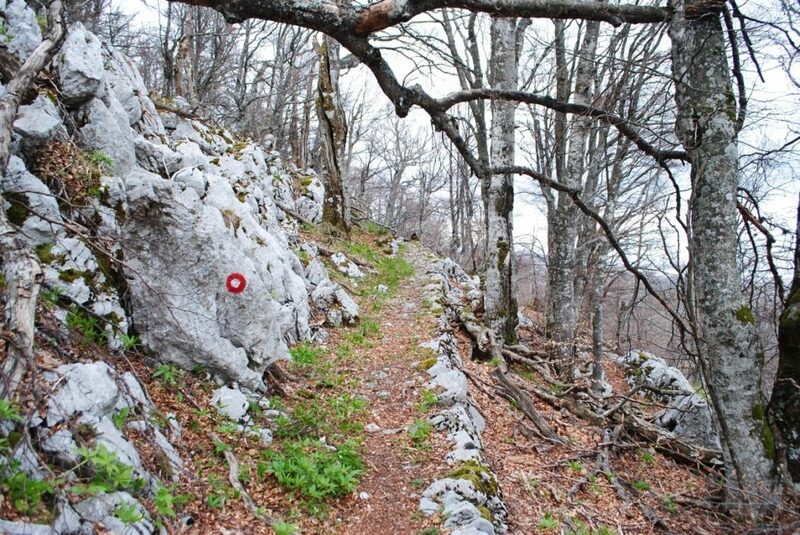 I left my bag for the final ascent through the crusted old snow to the peak of Sveto Brdo, a giant full-stop that comes just before Velebit before loses its momentum and becomes the lowlands and the sea. I had no view, just a lonely cross with a Virgin Mary and some scattered memorials. Descending out of the cloud I stopped to admire the plateau for the last time, the dry grass and the mountain pines, before plunging down a scree-covered path which began the journey home. I was due to stay in a high hut that night, but sitting in the porch in the drizzle in the early afternoon I found I’d run out of food. 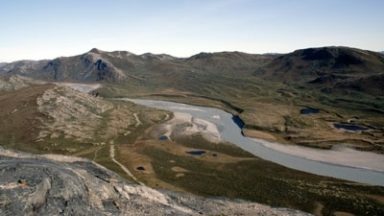 Not wanting to sit around I continued down, the parched limestone uplands giving way to mountain streams and grass. The sun was out by the time I reached the hostel at the heart of Paklenica, and there saw several happy words on a board: ‘bean soup and beer’. The bean soup turned out to have sausage floating in it, but as by this point I would have killed and eaten several animals I finished it off, bathed in the river, then collapsed into bed, my kit strewn over the floor. The hostel owners were kind enough to offer me more bean soup for free, as I was the only person there. 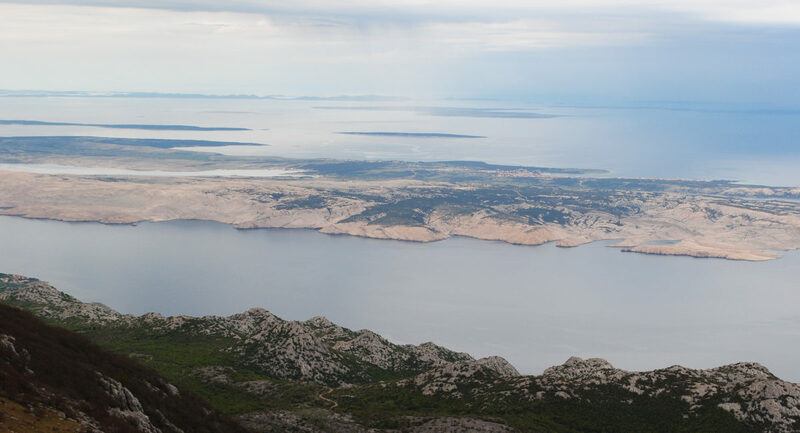 I finished my trip diary, light rain returning over the hills, birds in the trees, the long miles of the Velebit trail nearly over. 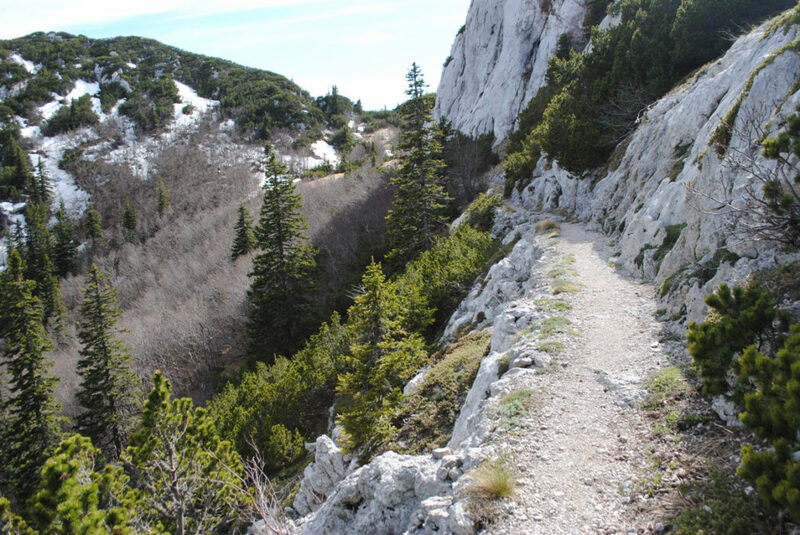 The way out of Paklenica was a wide track down the canyon. The sun shone and the mountains looked vast and unobtainable. The canyon closed in as the trail descended towards the sea. Groups of pensioners wandered up to look round the caves, while climbers roped up and gazed at the great wall of Anica Kuk. Then a café and a souvenir counter, hundreds of people climbing and chatting. Finally the road, the car park and the lonely walk down to the sea, mountains retreating again into cloud. I looked back towards the canyon and away along the coast, the hundreds of peaks coalescing into one wall: it looked small from here, the grey and green hiding the depth. 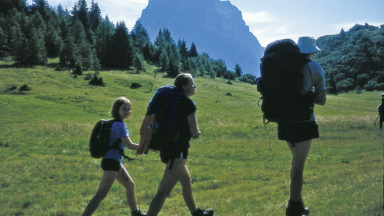 Back there lay summits, sink holes and huts, mountain pastures and sunlit woodland. Wolves and bears make their way unhindered through the depths of the forests, Croatian students party in a land once riven by war, mountains melt in the rain, and somewhere a dog has hopefully found its way home.